This is a mainstay in our family. LOVE this recipe. It’s from the amazing Vij in Vancouver and goes with almost anything. Make double or triple as it keeps well (and even freezes well). In a large pot, heat oil on medium heat. Keeping your head at a distance from the pot, add the curry leaves and mustard seeds and allow them to sizzle for about one minute or until a few seeds pop. Add tomatoes and remaining spices and sauté for 8 minutes or until oil glistens on top. Stir in coconut milk and bring to a boil. Reduce heat to medium low. Add zucchini. Cover and simmer to five minutes. 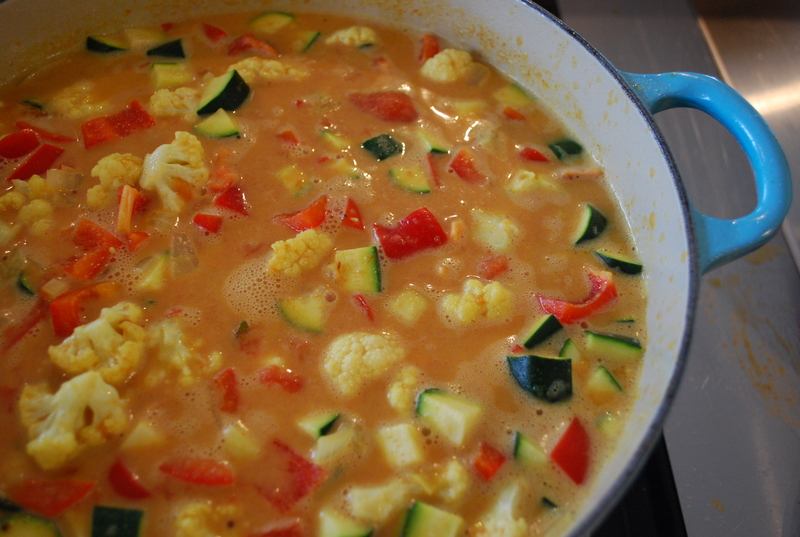 Add cauliflower and bell peppers, cover and simmer for another five minutes. Stir in cilantro. Ruth … where did you find fresh curry leaves? I’m guessing on Gerrard E. I don’t recall seeing any anywhere I regularly shop. Pamela … you can certainly get nice fresh and dried curry leaves on Gerrard East but you can also get really nice dried leaves (which are the ones I tend to use for this recipe) from Canadian Arvinda’s (who also make tea etc.). They come in a little silver tin with a dark green label.